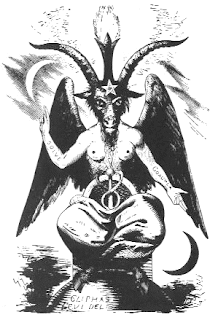 Baphomet’s name would next be taken up by the son of a Paris cobbler named Alphonse Louis Constant. Constant was a smart boy, and despite being born poor, his parents groomed him for the priesthood. Accounts differ as to why he was expelled from the seminary; either he fell in love or he wouldn’t give up vocalizing “strange views.” Whatever the reason, he never fully shrugged off the fetters of his Catholic upbringing. The conflict between his religious education and his fascination with the weird and the esoteric is present in all his work. 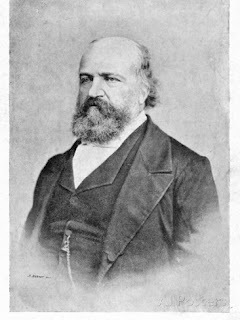 Unsurprisingly, in 1860 Constant reconciled with his church. When he died fifteen years later, he received the last rites. Before then, however, he would shape the entire concept of the occult in Western Civilization and become, perhaps unwittingly, a champion for Baphomet. When he began his magical writings, Constant transliterated his name into Hebrew. His first treatise Dogme et Rituel de la Haute Magie (Dogma and Ritual of High Magic) was published in 1856 under the name Eliphas Levi. Arthur Edward Waite later translated the work as Transcendental Magic, its Doctrine and Ritual (Sometimes also referred to or printed as The Doctrine and Ritual of Magic) in 1896. Levi barely made any money from his books during his lifetime. While his work could be fun and evocative, sometimes insightful with theories void of the worst traps of superstition, more often than not he tended to be wordy, ridiculous, and at times virtually incomprehensible. Mostly, he supported himself by "teaching" magic. However, despite being friends with the English novelist and practicing mystic Edward Bulwer-Lytton, Levi was more interested in theorizing than doing. In his lifetime, he was known to have carried out only a single magical working—the evocation of the ghost of the pagan philosopher and magician Apollonius of Tyre in 1854, an experience that supposedly disturbed him for the rest of his life (maybe even sent him back to the arms of his church). Levi’s image of Baphomet is of a human looking figure with breasts, wings, and the head and hooves of a goat. A candle rests between its massive horns, a pentagram graces its forehead, and a caduceus rises from its groin like a malformed phallus. It bears no resemblance to any of the allegations or descriptions mentioned in any of the records concerning the Templars. The most likely source of his inspiration was the work of Eugène Viollet-le-Duc, the gothic revival architect whose “restoration” of Notre Dame meant adding the now-iconic gargoyles to cathedral. Like any good occultist, especially one who made his living selling the occult, Levi hedged his bets by making his Baphomet cover everything. Levi referred to his image as Baphomet, The Goat of Mendes, and The God of the Witches’ Sabbath. In the very same chapter, Levi alternates between saying Baphomet: “…reproduces the exact figure of the terrible emperor of the night, with all his attributes and all his characters” and “…the god of our modern schools of philosophy, the god of the Alexandrian theurgic school and of our own mystical Neoplatonists…”, while still attributing his creation as the dark god who sat in worship at the witches’ Sabbath--though he very wisely also surmisses that the allegations that arose from the witch hunts were either outright lies or actual rites seen but completely misunderstood. Any association with Mendes is not historical, it’s all Levi. But for Levi, Baphomet was everything. He did not know how right he was.